Canon and Sony are both big names in the camera market. They are known for designing and producing high-quality models. Hence, quite too often, some people tend to get confused in choosing between the products of the two companies. If you are looking for a decent and reliable mirrorless camera, you may have put particular attention to Canon M3 and Sony a6300. Both of these models are heavily popular on the market. Which is the one that you should choose? Find the comparisons below! Comparing the two models, they have roughly the same size. Canon M3 is smaller than Sony a6300 by a few millimeters, but such difference is rather trivial. However, Canon M3 is quite noticeably lighter than Sony a6300. Both models have a textured surface on the gripping area in order to provide solid and firm handling. However, they do come with different control scheme. Canon M3 features a touchscreen display for control. The LCD is also rotatable, allowing for more flexible and versatile shooting positions including for taking selfies. On the other hand, Sony a6300 sticks with the classical but fully functional dial control. Some people prefer touchscreen control because it feels more sophisticated and intuitive; some others prefer dial control because of the simplicity and practicality. Indeed, Canon M3 and Sony a6300 each comes with a 24.2 MP APS-C CMOS image sensor, which means that they can generate similar image sizes. However, the internal engines that they use do differ. 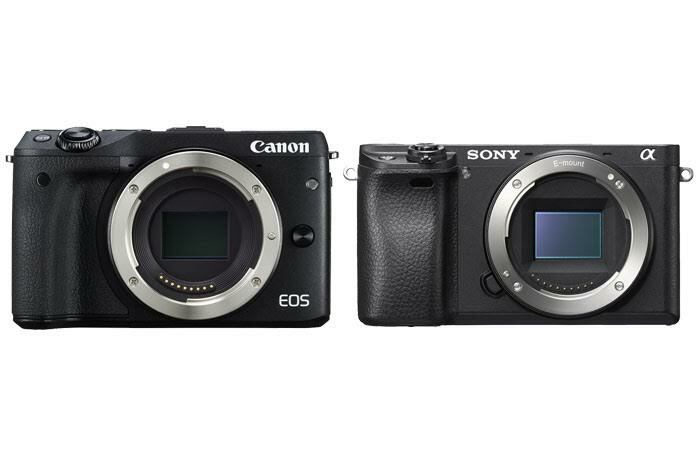 To begin with, Sony a6300’s sensor area is quite larger than Canon M3’s. With a larger sensor area, the camera will be able to capture more light, hence delivering better color depth and dynamic range. This is evident when we compare the generated images of the two models. Compared to Canon M3, Sony a6300’s pics have fuller, more solid colors. The shadows are depicted very well. Meanwhile, for videos, Sony a6300 easily defeats Canon M3, as the Sony camera boasts 4K Ultra HD video recording whereas the Canon camera still relies on 1080 Full HD maximum video resolution. Furthermore, Sony a6300 comes with better ISO range than Canon M3. Sony a6300 is famous for its astonishing autofocus system, which features a total of 425 phase-detection points. The AF system is stunningly fast, covering every part of the frame for maximum tracking performance. Combined with the 11fps photo burst, Sony a6300 makes a great choice for sports photography as well. Canon M3 only has 49-point AF system and 4.2fps photo burst. All in all, we recommend you to choose Sony a6300. The output quality and performance are much better!